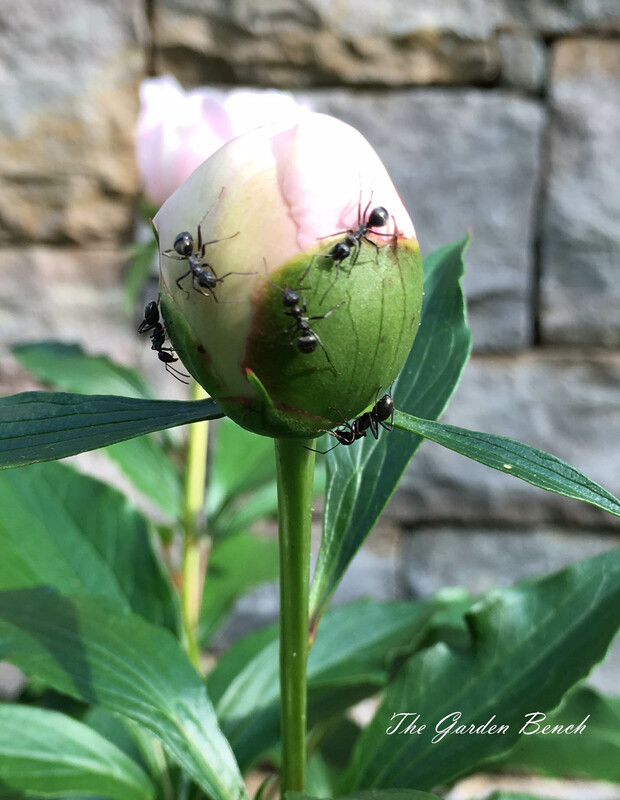 Ants on peonies: Welcome visitors or creepy pests? I love peonies, their flowers and their fragrance. But when ours are blooming they always seem to be covered with ants! They crawl all over the buds. Sometimes they are small ants, and sometimes large black ants. How can we get rid of them? You don’t want to get rid of them. The ants are not harming the peonies, and in fact they may have a part to play in helping to open the dense flower buds of some varieties. According to the Heartland Peony Society, it is believed that peonies produce nectar that attracts them for this purpose. It’s normal, and temporary. After the peonies are open, the ants often disappear. There are flat, brightly colored bugs all over my cabbage and broccoli plants right now. What are they? Are they harmful? How can I get rid of them? 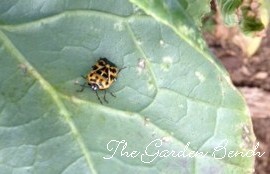 What you see plaguing your plants are, no doubt, harlequin bugs, and yes, they are harmful to your plants in the brassica family – broccoli, greens, cabbage turnips and kale. This time of year, the bugs you see are probably the adults. They use piercing mouth parts to extract the juices from all parts of the plants, and heavy infestations can cause severe damage – you may see discolored spots on the plants. The leaves of young plants may wilt and die, and mature plants will become stunted. Getting rid of them can be a challenge. Toxic Free NC, A website devoted to non-toxic solutions to pest problems, suggests removing them by hand if there are only a few (drop them into a bucket of soapy water), or if there are large numbers and you are willing to sacrifice the plants they have damaged, trap them in large garbage bags, seal the bags and let them bake in the sun for a few days. It’s always good to encourage the natural predators of damaging insects to visit the garden. Praying mantises eat harlequin bugs and other stinkbugs, so if you see them around, don’t shoo them off. There are parasitic flies and wasps that are among stinkbugs’ natural predators, and birds, spiders and toads also enjoy them as a food source. As a last resort, Toxic Free NC suggests insecticides that are approved for organic farms, such as rotenone, pyrethrin, Neem oil and insecticidal soap. Note that these products can be harmful, so be sure to follow label directions and use as little as possible. These insecticides can also kill the bugs you want to keep, so spray only in the morning or late evening when those insects may be less active. Insecticides are most effective on the pests in the younger larval or nymph stages. The adult bugs are resistant to sprays. To prevent the bugs from finding your plants in the first place, Toxic Free NC suggests using lightweight floating row covers over your brassica crops, making sure the edges are weighted so the bugs can’t get to the plants. It also helps to control weeds in the garden, as stinkbugs are attracted by weedy areas in or near the garden, they advise. I’m having a problem with Japanese beetles. I have beetle traps hanging around my garden and they catch a lot of them, but beetles are still chewing on my wisteria and rose bushes. I don’t want to spray, so every day I hand-pick them off. What else can I do? 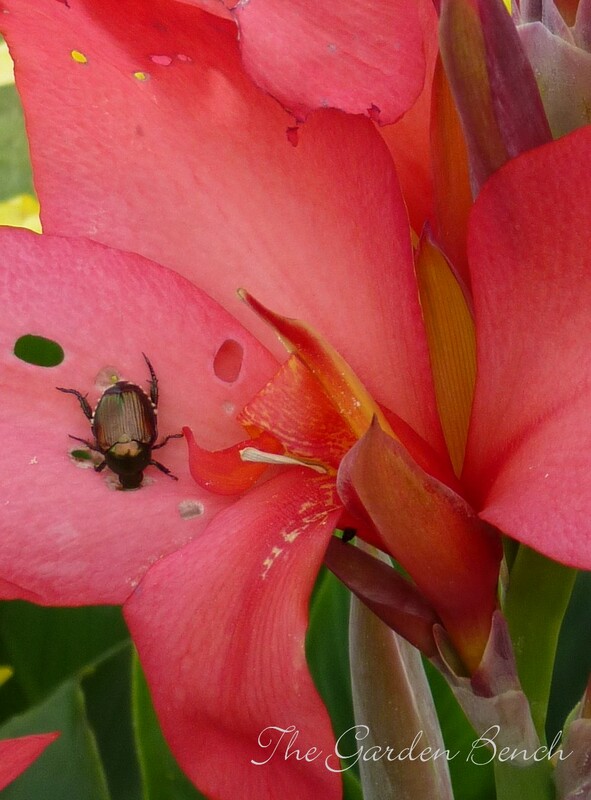 Japanese beetle feeds on canna flowers. Those Japanese beetle traps work by using a chemical that mimics a pheromone produced by the female Japanese beetle to lure the male beetles. You now see how well this works, as you are drawing more and more Japanese beetles into your yard where, on the way to the trap, they stop to dine on your plants. Extension agents say that if you use these traps, it’s best to place them a good distance from any plants you want to save, so they will be lured away from the plants. Generally, most experts advise against using them at all. Good for you for choosing not to spray chemical killers – the honeybees and other pollinators are safe in your landscape. Handpicking the beetles or knocking them off into soapy water is an effective short-term method for reducing the population in your garden. The best time of day may be early morning, when they apparently are more sluggish. Biological control of Japanese beetles begins with understanding their life cycle. Young grubs hatch in the soil in late summer and feed on roots, then spend winter in the soil. They become active in spring and continue to feed. Adult beetles begin to emerge in June. You can treat the lawn with milky spore, a bacterium that kills the grubs in the soil. Milky spore builds up in the soil over several years and suppresses the grub population over time — no grubs, no Japanese beetles to hatch and harass your plants. The University of Tennessee Extension has a publication about controlling Japanese beetles. You can read it here. 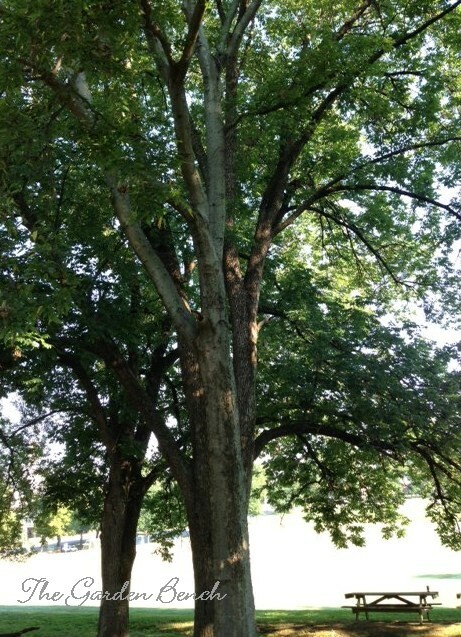 QUESTION: We have a question regarding one of our large hackberry trees. It’s covered with little white flying bugs and the leaves have a sticky residue. What causes this and is there something that we can do about it? Asian wooly hackberry aphids are a nuisance, but won’t harm the trees. The bugs you are seeing are called Asian wooly hackberry aphids, and they seem to make an appearance about this time every year. They feed exclusively on hackberry trees, and like all aphids, they feed by piercing the leaves and extracting the juice. The sticky residue is what they excrete after feeding on the leaves, a substance called honeydew. Another byproduct you may notice is a black mold that grows on the honeydew, which is called sooty mold.The aphids apparently do not do enough damage to harm the tree, they are just a nuisance, mostly in late summer and early fall when their population grows due to the many generations that have been produced. If it’s a nuisance you can’t tolerate for some reason, there is a systemic insecticide product that is said to be effective in controlling aphids, but it would not do anything to solve this year’s population. There are several brands available, but the main ingredient is a chemical called imidacloprid, and it should be applied to the ground around the tree in early spring, where it will be taken up via the tree’s vascular system into the leaves. Not much, then, can be done about this year’s population of hackberry aphids. Hose off the cars, the deck, the lawn furniture and anything under the trees that are sticky from the honeydew, and take comfort in the knowledge that they are a temporary annoyance, and will be gone in a few weeks. QUESTION: The leaves on some of my squash plants are beginning to wilt. Some of the small squash are rotting. What’s the reason? 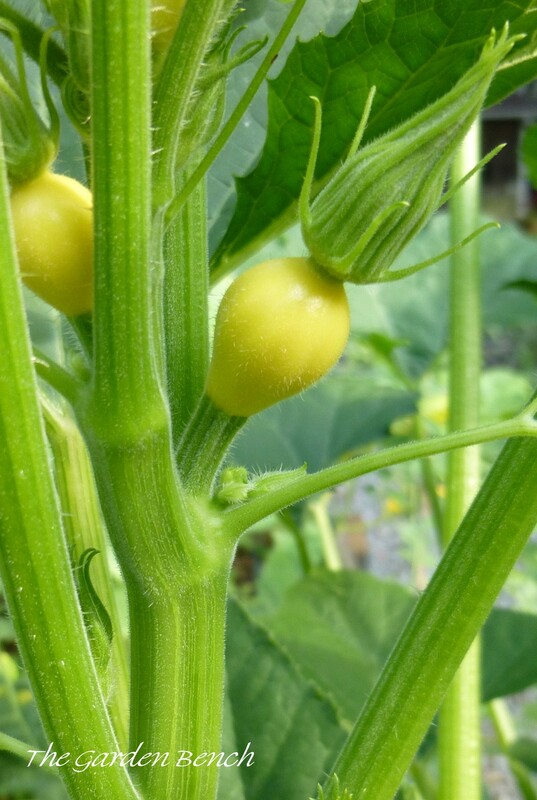 When summer squash plants begin to go bad, you can probably blame it on insect pests. Two likely culprits: the squash bug and the squash vine borer. “When squash leaves wilt and collapse, the squash bug is usually the pest to blame,” says extension agent David Cook. Squash bugs lay small, bronze-colored eggs on the undersides and upper surfaces of the leaves. Nymphs are gray with black legs, and are usually found in groups; adult squash bugs are broad and flat. They pierce the leaves and remove the sap, leaving the leaves wilted. You may also find them on cucumbers, melons and pumpkins. well.) If you feel you must spray something, Cook says insecticides labeled for squash bug include bifenthrin, or permethrin. Always read and follow label directions. If a long branch of the plant — or the entire plant — wilts suddenly, it’s the work of the squash vine borer, the larva of a moth that lays her eggs on the leaf stalks and vines. 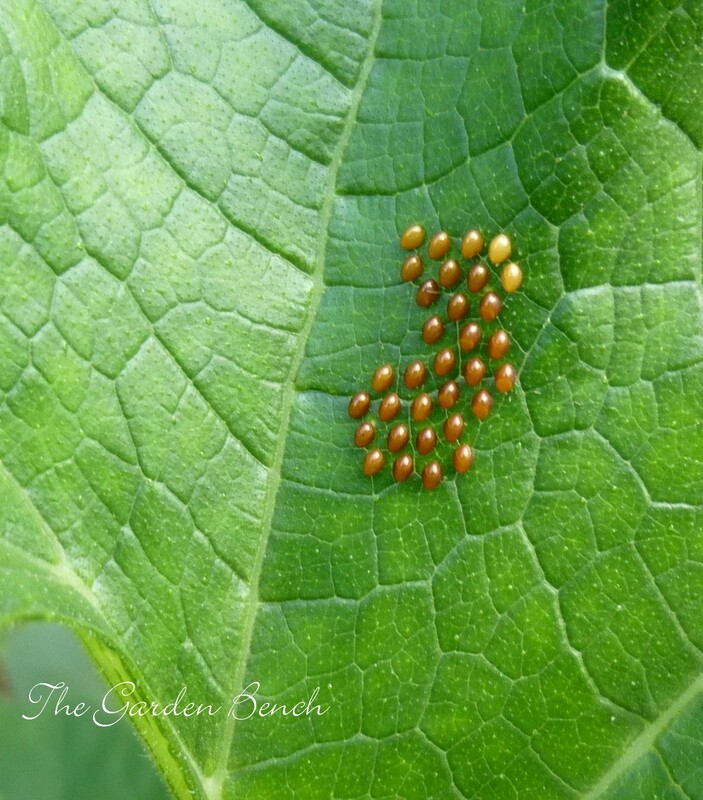 The eggs hatch in about a week, and the larva bores into the stem of the plant and begins to feed. If you look closely, you may find sawdust-like material near the base of the plant. To try to save the vine, split the stem open and remove the caterpillar. Mound soil up around the wound to encourage roots to grow. After the larva enters the stem, insecticides are ineffective, so if you choose to use a chemical treatment, you have to start early. Cook says insecticides labeled for squash vine borer include bifenthrin, permethrin, carbaryl and esfenvalerate, and spinosad, which is considered a natural insecticide. Again, be sure to follow label instructions. QUESTION: Some of the plants I brought in from outdoors seem to have tiny white flying bugs all around them, and are a nuisance. What are they? And what can I do about them? 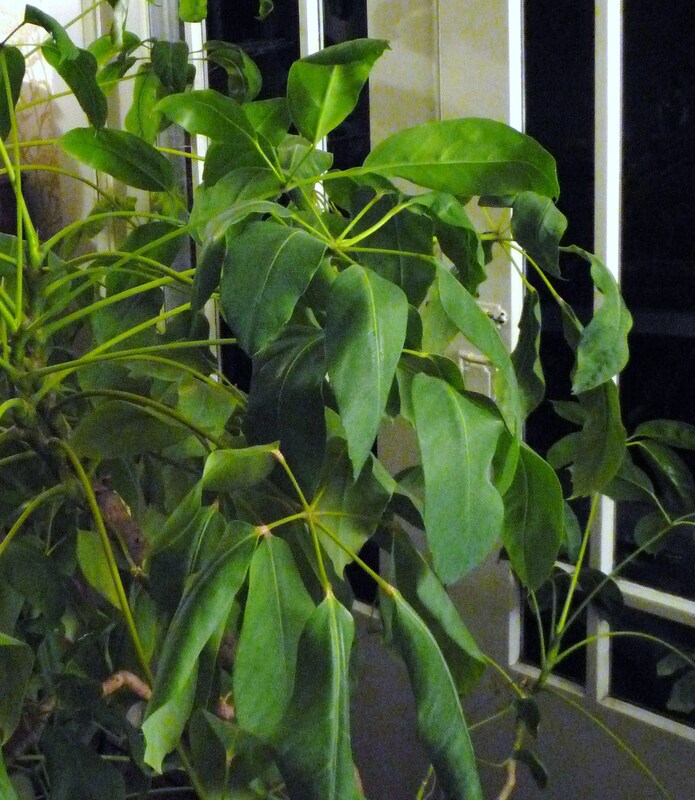 Schefflera can play host to whiteflies. These are likely whiteflies, and they often ride in on plants that spent summer outdoors. They’re more than a nuisance; they feed on the plant’s juices and can cause the leaves to turn yellow and die. The insects that are flying are the adults, and if you look at the undersides of the leaves you may be able to see the tiny yellow eggs and larvae. Whiteflies feed on dozens of plant species and they reproduce quickly, so the problem could get out of hand quickly. To get rid of them, remove the badly infested leaves, then rinse the plant thoroughly and spray with an insecticidal soap. Be sure to treat the undersides of the leaves. Repeat the spraying every week or so. Aphids: they usually gather in clusters on tender young leaves. They also feed on a plant’s juices. Insecticidal soap, or washing with water or rubbing alcohol, is usually effective. Mealybugs: You may see white, cottony clusters on stems or leaves, or where the leaf joins the stem. They also feed on the plants, so get rid of them by rubbing them off with water or alcohol. Spider mites: They are barely visible, but you’ll certainly notice the damage – light-colored, speckled areas on top surfaces of leaves. You may see webbing stretching between leaves if there is a heavy infestation. Wash the plant with soapy water, and treat with insecticidal soap a day or two later. It may require diligence and several applications to control these insects. UT Extension provides a booklet at its Web site that addresses these problems and more: Insects and Related Pests of House Plants (PB1157).